Son­ja Knecht grew up in Venezuela. Fran­co­nia, Ham­burg and today lives in Berlin. After study­ing lan­guages and human­i­ties she worked as a trans­la­tor, graph­ic desin­er, project leader, con­cep­tion­er, copy­writer and, until recent­ly, as Direc­tor Text for Eden­spiek­er­mann (2008–2014). There she devel­oped the cor­po­rate blog, but became recog­nised pri­mar­i­ly for her inter­views with col­leagues (»3 Fragen«/three ques­tions) and con­tri­bu­tions on typo­graph­ic projects. She is par­tic­u­lar­ly inter­est­ed in the (inter-)cultural aspects of script. As a copy­writer and writ­ing coach, Son­ja Knecht sup­ports agen­cies and their clients in PR work. She has writ­ten style books for major com­pa­nies, and worked on the devel­op­ment of cor­po­rate image strate­gies and cam­paigns. She has writ­ten for typog­ra­phy pub­li­ca­tions like FontShop News, cov­er­ing fonts, writ­ing, lan­guage – and the peo­ple who are involved in this field. 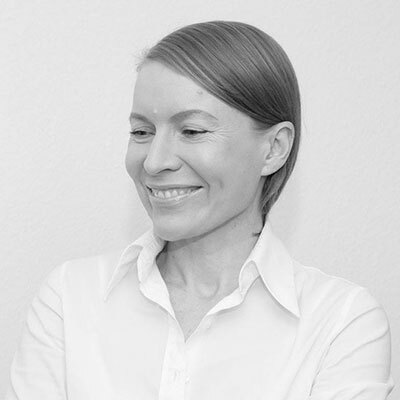 She leads the edi­to­r­i­al team of TYPO Berlin. As a co-organ­is­er and pre­sen­ter, Son­ja Knecht also brings her ideas to oth­er design con­fer­ences.